It seems like every year, about this time, I get anxious to vacation. I think it's a combination of the after holiday blue's + the seemingly never ending crummy winter weather. I know spring is just around the corner but I still can't help but feel a little cabin fever. We typically try to do a camping trip at least once a year. 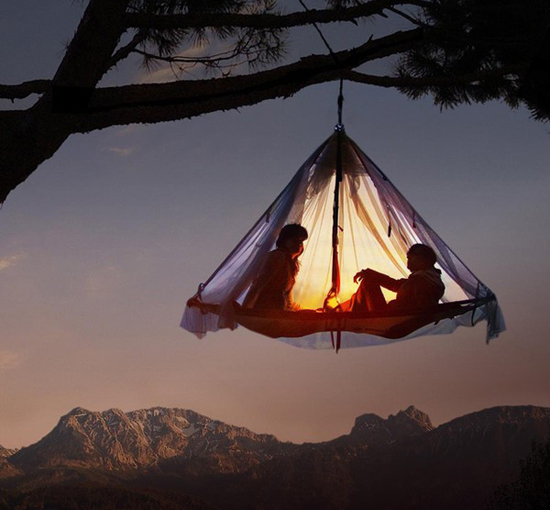 Honestly, camping is not very high on my list when it comes to dream vacations...but after seeing this photo, I'm convinced we've been going about it all wrong! Does any one else have the vacation itch? I can't imagine camping while pregnant! Though if you can pull it off, more power to you! I know what you mean about the vacation itch though...I definitely get antsy from time to time and wish I could just run off for a couple of days to a new place and come back refreshed! Haha!!! Heather's thoughts came to my mind, too!! I also wonder how they are not both sunk in the middle?? It doesn't look very supported yet....ack, now I'm no fun!!!! But YES!! Just yesterday I was doing dishes having thoughts of being away!! Not a big trip (not that I would turn a big trip down) but even a weekend away to Palm Springs or something to get the cobwebs out sounds lovely!!! stumbled onto your blog and just wanted to leave you a little blog luv! Def enjoyed reading this post!! Thanks for sharing your thoughts about bad credit bank loans. I needed about this subject and didn't know who to ask. % to pressure the message home a little bit, however instead of that, that is excellent blog. An excellent read. I will certainly be back. Truly no matter if someone doesn't be aware of then its up to other users that they will assist, so here it takes place. Google, and found that it is really informative. I'm going to watch out for brussels. I'll be grateful if you continue this in future. Thanks for sharing your thoughts about private krankenversicherung leistung. I'm gone to inform my little brother, that he should also visit this website on regular basis to get updated from latest reports. about your article on AOL? I require a specialist on this house to resolve my problem.